I’m going to start with a thanks to all the lovers and all the haters this week. Gewurztraminer has clearly been a bit of a tough week for a few of you, so thanks for doing it, and thanks for your comments. It’s been an eye opening week with plenty of food pairing successes and a fair few fails (I had one of each!). I made it through all four of the wines I recommended this week, and here’s what I thought! On Friday night, the missus and I had the TTD from Sainsbury’s and the Morrison’s Selection with the honey and mustard chicken legs. First and foremost I think it requires noting this was my food pairing fail. I had said that I wasn’t sure whether it would work and unfortunately it just didn’t. The glaze was just way too sweet. Gorgeous, but too sweet for the wine. I think the thing with Gewurztraminer, or at least the ones we had that night, they hinted that they might be off-dry (a tad sweet) when you gave them a sniff, but then on the tongue they were dry, and both had a bitter finish. So yeah, it just didn’t fit. The chicken was very nice, just not a great match! The Sainsbury’s TTD was an interesting one. If you like turkish delight, you’ll like this one! Rose petal and cardoman was there with the tropical fruit lychee. I loved the smell, and the sweet spice ginger sniff was there as well. On the taste it was oily, medium bodied, and with medium acidity. The slight drawbacks for me were that firstly the flavours that the smell promised just didn’t happen on the taste (other than the ginger), and the aftertaste was rather unashamedly bitter. 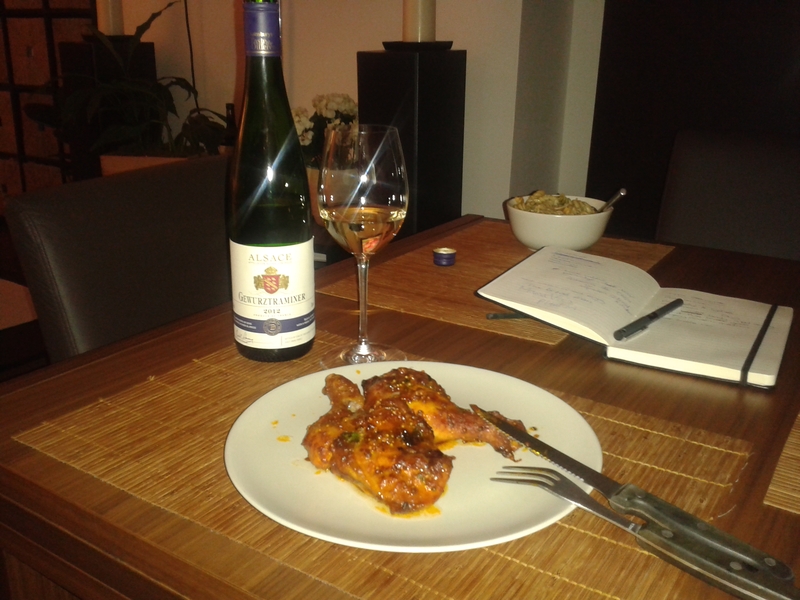 That’s not to say I didn’t like it, I since found out that’s a bit of a Gewurztraminer-kind-of-thing. The Morrison’s Signature was all different again. Of all the four that I tasted this week, this was the one where if I had it in a blind tasting I wouldn’t have been able to say what it was. There was much less sweet spice flavours, the aroma was more mango than anything else, and the acidity was a lot higher. Even the bitterness of the aftertaste was only very subtle. It was a genuinely refreshing wine to drink and I’m not sure that’s the point of Gewurztraminer. It’s unashamedly different as a wine and I don’t think this one was. It was very pleasant, but just not very expressive of the variety. On Saturday night we were up north for my nan’s 90th. 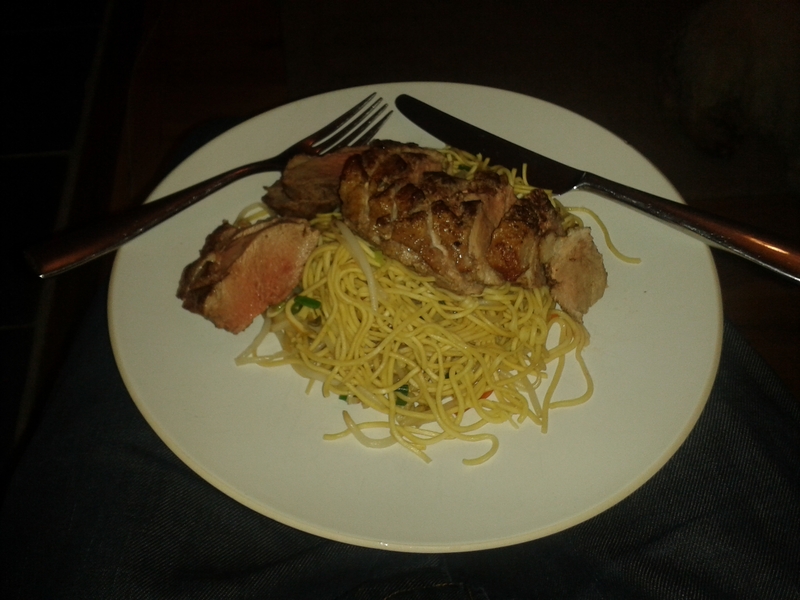 I was sat around with my wife, my sister and her husband, and my dad, as we all tucked into the ginger and five spice flavoured duck breasts, with a bit of spicy noodles to go with. Food pairing success ladies and gentlemen! Both the Zind-Humbrecht from Majestic and the Jean-Victor Senner from Spirited Wines were both great with it. And it wasn’t hard to make. And it doesn’t create much washing up. Happy days! The ginger and five spiced duck, the winner! The Zind-Humbrecht was straight back to an expressive Gewurztraminer. The sweet spice was back, the mango fruit was bold and vibrant, it was a great and distinctive smell in the glass. What I liked about this one was that the flavours didn’t die in the mouth. Everything in the glass delivered on the tongue, and the bitterness of the finish, I have to say, is a bit more easy to take when you’re expecting it. You’re almost perversely pleased that it’s there. When you pair it with the five spice and ginger duck it just helps so much with that aftertaste. Again it was back to oily, full bodied, and at the lower end of acidity. Last but most definitely not least, the Jean-Victor Senner. It was, without a shadow of a doubt, my favourite of the week. Not that it had anymore great smells than the others. It was very similar to the others with lychee and ginger being very prevalent. The biggest difference here was the balance of the wine in the mouth. The oiliness wasn’t a separate thing, it was all beautifully together with the alcohol feeling, and the aftertaste was great. Yes it was bitter, but also with the fruit and spice and those flavours lasted really nicely for nearly a minute afterwards. If you were struggling with Gewurztraminer this week then I’d really recommend this one to have a go with to change your mind if needed! A great week with our first real controversy of 2014. I’m going to find it really tough to mark this one because it is just a very different wine. But i think some marks will have to be knocked off because of how much it needs the right food pairing to get it right. Versatile it definitely is not. An enjoyable and educational 6/10.